A South Korean temple with stone Buddhas and pagodas has been added to UNESCO's tentative list of world cultural heritage sites, officials here said Monday. 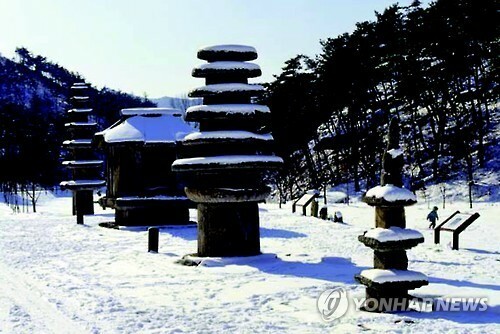 The Cultural Heritage Administration said the South Korean government's request in January to include Unjusa Temple in Hwasun, South Jeolla Province, some 330 kilometers south of Seoul, to the tentative list has been approved by the United Nations' specialized agency. It will be officially listed as "Stone Buddhas and Pagodas at Hwasun Unjusa Temple." The temple was established at the beginning the Goryeo Dynasty (918-1392) and is believed to have flourished with stone statues and pagodas until the 16th century when the site was burnt down during the Japanese invasion, according to UNESCO. The state-designated historic site has 141 stone pagoda relics and 115 stone Buddha statues on the property. Adding a property to the tentative list is a necessary first step in the process of nominating a site to the World Heritage List, because a country cannot nominate a place unless it has been on the tentative list for at least a year.